The Mission Impossible franchise has always been partially sidelined when you look at action and espionage film series', and it's starting to become difficult to understand why that is. There's no doubts about it that, should an MI trailer be aired directly before a James Bond trailer, everyone would wind up discussing the latter and perhaps only briefly mentioning the former. Franchises like Bond and Bourne repeatedly released films to critical acclaim and good box office performances, whereas MI seemed to consistently fall a bit behind. But this argument dissipated with the release of 2011's Ghost Protocol, an MI film that was almost universally respected and succeeded in thrashing the box office sum of any prior film in the franchise. MI still might not hold the respect levels of the Bond franchise, but bouncing off the back of the stellar Ghost Protocol, Tom Cruise and co have thrown themselves back into the spotlight with Rogue Nation, a film that might not be as wildly enthralling as its predecessor but still offers everything you'd want from a film of this sort and more. Continuing on from the plot thread left hanging at the end of Ghost Protocol, Rogue Nation deals with a corporation known as the Syndicate who are committed to destroying the IMF. But matters are made worse by the IMF being disbanded and merged into the CIA, leaving Ethan Hunt (Tom Cruise) no other option than to pull his old team back together and eradicate the Syndicate in order to prove its existence to the government who disbanded the IMF. If there's one thing that Rogue Nation excels in above Ghost Protocol, it is its story. Whilst Ghost Protocol was the variety of action film that scarcely slowed down, jumping from set piece to set piece and barely pausing for breath, Rogue Nation does away with that formula early on in the film. But it works in its favour; this fifth installment takes on an impressively intelligent story, and one that is layered with so many twists and turns that never begins feeling stale. While Ghost Protocol is an almost undeniably superior film, its general story isn't quite as interesting as this, which gives Rogue Nation an immediate advantage. But where this MI film loses its advantage is in its unusual, almost frustrating pacing. We kick off with that plane sequence that occupies every trailer for this film, and it immediately feels underwhelming due to its placing so early in the narrative. It's a thrilling sequence, granted, and it looks great, but for it to take place so early in the film it ends up losing its dramatic weight; there isn't really anything to it. After the opening titles the story is set up and things calm down for a while, before taking us into an opera house for a sequence that feels like it should end quite a few minutes before it does. Again, much like the plane scene, it's a smart sequence, using almost Hitchcock-like camera tricks and movements to its advantage, and feels more like the final act of a small scale espionage film than an early set piece in an MI installment. It's wonderfully intense, but it doesn't feel right in the film's time frame, and it seems to go on for much longer than it needs to. The first hour or so of this two hour film is consistently enjoyable, but something feels off the whole way through. Luckily, once Rogue Nation leaves the opera house it scarcely puts a foot wrong. The film explodes into a frenzy of fresh set pieces, smart narrative twists, good thrills and solid humour. Rogue Nation peaks around its midpoint, in a particularly intense underwater sequence that almost gives the entire Dubai set piece in Ghost Protocol a run for its money. I say almost, of course, because will the MI franchise ever do anything as great as the Dubai sequence in film four? But this underwater scene perfectly captures and demonstrates what has made these latest two installments such enjoyable, distinguishable blasts of action in an industry that churns out so many of these films per year nowadays. Since Brad Bird hopped into the series for one film, MI has changed considerably, and recognised that the formula works best when it lightens up a bit, both visually and tonally. Ghost Protocol is a much lighter film than its predecessor, and its the best of the franchise. It's nice to see that Rogue Nation recognises this and heads in the same direction. It's difficult to come out of this film without the underwater sequence front of mind. It's a thrillingly intense piece of cinema that manages to just push the boundaries of realism in the ways that we all want an MI film to do, but also works in playing a key role in the film's ever deepening story, whilst feeling completely different to anything the franchise has offered before. It's an annoyingly short sequence that easily stands as the best moment of the film, perhaps due to its structural similarities to Ghost Protocol's Dubai sequence. We have an intense action sequence in an interesting setting that hurls directly into a high octane chase, without calming down in between. Rogue Nation finds different places to calm down, and it sticks the landing every time it does thanks to its highly commendable story. It also helps that we have a cast, here, who are willing to do pretty much anything for these films now (Tom Cruise was actually on the outside of that plane. He was actually on the outside of that plane. ), and they are as much a part of what makes these films so enjoyable as anyone putting it together behind the scenes. Thoughts will vary as to where Rogue Nation places in the series' rankings, but there's no denying it's an absolute blast of a film, bolstered mostly by its smart plot and a series of well constructed action sequences. It's a shame, really, that the first hour of this film struggles with its pacing, as if those kinks were worked out then Rogue Nation could have been something truly special. I spent the first sixty minutes worrying that what was set up to be a compelling story would fail to push its way out of 'premise' status, because the film doesn't do enough to keep it moving in its first half. But once it finds its feet and both the story and the action move up a gear, it's smooth sailing until the finish line. Rogue Nation might not be something as special as Ghost Protocol, but I feel confident in stating that I don't believe the MI franchise will ever top that film. As it is, Rogue Nation is an admittedly uneven dose of action, but one that really hits the mark in its second half, acting as a great way to spend two hours, while keeping audiences everywhere excited for film six. Will MI ever be as big as Bond? I'm not sure. But if it keeps putting out films like this, it has all the hope in the world. 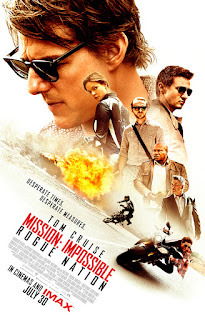 To Summarise: Uneven pacing prevents it from matching the highs of its superb predecessor, but Mission Impossible: Rogue Nation remains a nicely acted and suitably action packed thriller with a surprisingly smart story at its core.